It’s back-to-school time in Southern Maine and Xavier Botana is ready to get started as Portland Public School‘s (PPS) Superintendent. Born in Cuba and raised in Madrid, Spain and Chicago, education has always been a big part of Botana’s life. His grandmother taught him that “education is the only thing that no one can take away from you” and he’s been sharing that sentiment with school-age children since he started his career. 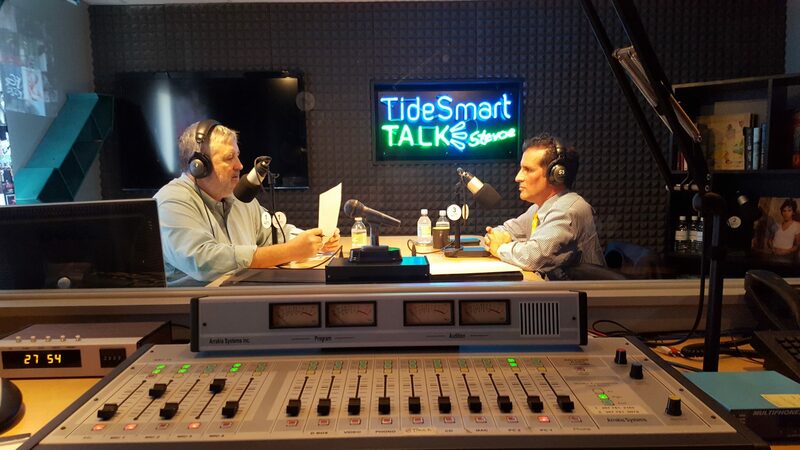 Host of TideSmart Talk with Stevoe, Steve Woods, welcomed Superintendent of Portland Public Schools, Xavier Botana (at right). Botana started his career in Greater Chicago teaching English as a Second Language (ESL) in an immigrant community and found himself “coaching” other teachers in the growing school district. This is where he got his first taste of administration and he fell in love with the idea of being able to help a greater number of children. While working in the Chicago Public School system, Botana had the opportunity to work with the now US Secretary of Education, Arne Duncan, who showed him that strong and consistent leadership over a course of several years can really have a positive effect on a community. So when Botana discovered the vacancy in the Portland Public School system, he felt like he had the opportunity to do the same. Botana and his family have visited Maine on several occasions before becoming aware of the position in Portland. The funny part about the Botana’s ending up in Portland is that he didn’t mean to at all. A saved Google news feed of Portland, Oregon (where his last job was located) pulled an article that caught Botana’s eye about the exiting Superintendent in Portland, Maine. He kept his eyes open for the official posting and was one of 40+ candidates for the job. Botana has been “on the job” for a little over six weeks now and is looking forward to settling in to the school district of 7,000+ K-12 students, 3,000+ adult education students, and 500+ teachers. In a district and community where over 60 languages are spoken, Botana is well versed in ESL and ready to co-author the PPS strategic plan for the future. In his opinion, this is a “dream population to work with” and he’s ready for the challenge. To learn more about the new Superintendent or the Portland Public School System, listen to the interview below or go to PortlandSchools.org. Posted on Wednesday, August 31st, 2016 and filed under Show Recaps.